(Chris Detrick | The Salt Lake Tribune) Wisconsin Badgers linebacker Leon Jacobs (32) Wisconsin Badgers defensive end Alec James (57) Wisconsin Badgers linebacker Chris Orr (54) and Wisconsin Badgers defensive end Conor Sheehy (94) tackle Brigham Young Cougars running back Ula Tolutau (5) during the game at LaVell Edwards Stadium Saturday Saturday, September 16, 2017. Wisconsin Badgers are leading Brigham Young Cougars 24-6 at halftime. 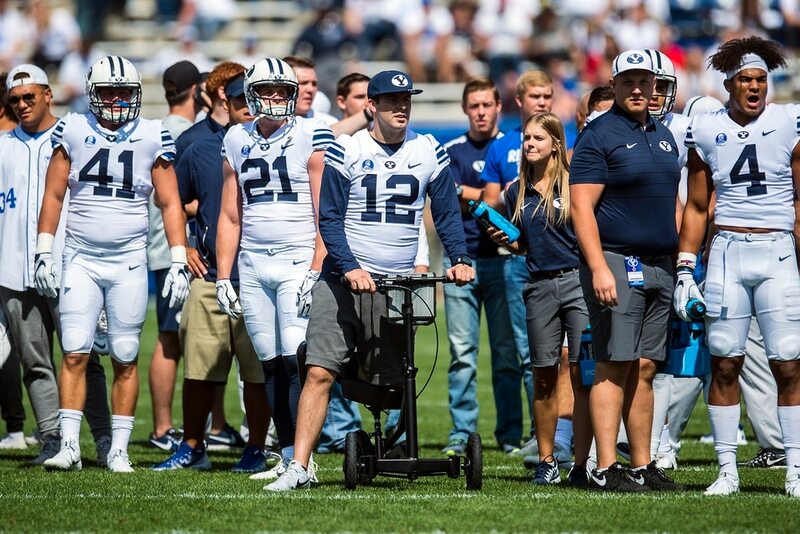 (Chris Detrick | The Salt Lake Tribune) Brigham Young Cougars quarterback Tanner Mangum (12) watches practice before the game at LaVell Edwards Stadium Saturday Saturday, September 16, 2017. (Chris Detrick | The Salt Lake Tribune) Brigham Young Cougars quarterback Tanner Mangum (12) watches practice before the game at LaVell Edwards Stadium Saturday Saturday, September 16, 2017. (Chris Detrick | The Salt Lake Tribune) Brigham Young Cougars quarterback Tanner Mangum (12) watches practice before the game at LaVell Edwards Stadium Saturday Saturday, September 16, 2017. (Chris Detrick | The Salt Lake Tribune) Brigham Young Cougars run off of the field before the game at LaVell Edwards Stadium Saturday Saturday, September 16, 2017. 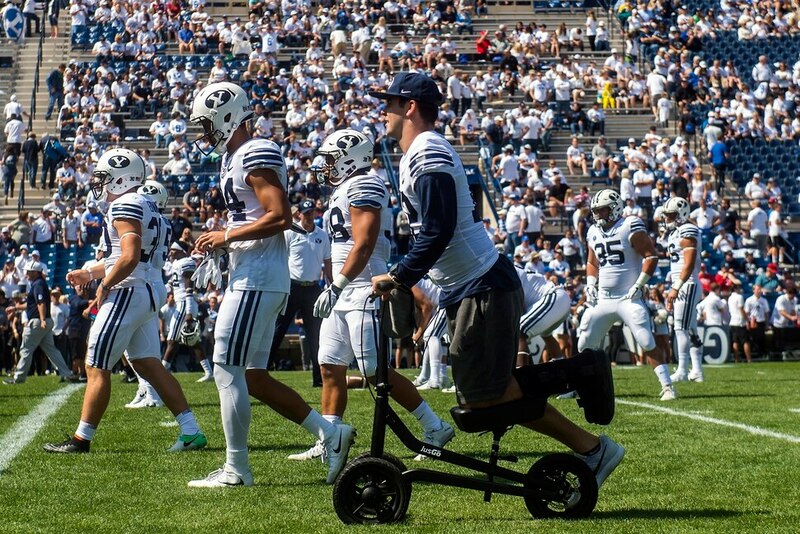 (Chris Detrick | The Salt Lake Tribune) Brigham Young Cougars quarterback Tanner Mangum (12) watches practice before the game at LaVell Edwards Stadium Saturday Saturday, September 16, 2017. (Chris Detrick | The Salt Lake Tribune) Wisconsin Badgers linebacker T.J. Edwards (53) Wisconsin Badgers defensive end Conor Sheehy (94) Wisconsin Badgers nose tackle Olive Sagapolu (99) and Wisconsin Badgers linebacker Chris Orr (54) tackle Brigham Young Cougars running back Squally Canada (22) during the game at LaVell Edwards Stadium Saturday Saturday, September 16, 2017. Wisconsin Badgers are leading Brigham Young Cougars 24-6 at halftime. (Chris Detrick | The Salt Lake Tribune) Wisconsin Badgers wide receiver Quintez Cephus (87) scores a touchdown past Brigham Young Cougars defensive back Dayan Ghanwoloku (5) and Brigham Young Cougars linebacker Butch Pau'u (38) during the game at LaVell Edwards Stadium Saturday Saturday, September 16, 2017. Wisconsin Badgers are leading Brigham Young Cougars 24-6 at halftime. (Chris Detrick | The Salt Lake Tribune) Brigham Young Cougars quarterback Beau Hoge (7) falls to the ground during the game at LaVell Edwards Stadium Saturday Saturday, September 16, 2017. Wisconsin Badgers are leading Brigham Young Cougars 24-6 at halftime. (Chris Detrick | The Salt Lake Tribune) Wisconsin Badgers safety Natrell Jamerson (12) tackles Brigham Young Cougars quarterback Beau Hoge (7) during the game at LaVell Edwards Stadium Saturday Saturday, September 16, 2017. Wisconsin Badgers are leading Brigham Young Cougars 24-6 at halftime. (Chris Detrick | The Salt Lake Tribune) Brigham Young Cougars quarterback Beau Hoge (7) runs off of the field during the game at LaVell Edwards Stadium Saturday Saturday, September 16, 2017. Wisconsin Badgers are leading Brigham Young Cougars 24-6 at halftime. (Chris Detrick | The Salt Lake Tribune) Wisconsin Badgers wide receiver Danny Davis III (6) makes a catch over Brigham Young Cougars defensive back Micah Hannemann (7) during the game at LaVell Edwards Stadium Saturday Saturday, September 16, 2017. Wisconsin Badgers are leading Brigham Young Cougars 24-6 at halftime. (Chris Detrick | The Salt Lake Tribune) Brigham Young Cougars quarterback Beau Hoge (7) remains on the ground during the game at LaVell Edwards Stadium Saturday Saturday, September 16, 2017. Wisconsin Badgers are leading Brigham Young Cougars 24-6 at halftime. (Chris Detrick | The Salt Lake Tribune) Brigham Young Cougars quarterback Beau Hoge (7) falls to the ground during the game at LaVell Edwards Stadium Saturday Saturday, September 16, 2017. Wisconsin Badgers are leading Brigham Young Cougars 24-6 at halftime. (Chris Detrick | The Salt Lake Tribune) Wisconsin Badgers running back Jonathan Taylor (23) scores a touchdown past Brigham Young Cougars defensive back Tanner Jacobson (25) during the game at LaVell Edwards Stadium Saturday Saturday, September 16, 2017. Wisconsin Badgers are leading Brigham Young Cougars 24-6 at halftime. (Chris Detrick | The Salt Lake Tribune) Wisconsin Badgers running back Jonathan Taylor (23) runs the ball past Brigham Young Cougars defensive lineman Sione Takitaki (16) and Brigham Young Cougars linebacker Matt Hadley (2) during the game at LaVell Edwards Stadium Saturday Saturday, September 16, 2017. Wisconsin Badgers are leading Brigham Young Cougars 24-6 at halftime. (Chris Detrick | The Salt Lake Tribune) Wisconsin Badgers linebacker Leon Jacobs (32) Wisconsin Badgers defensive end Alec James (57) Wisconsin Badgers linebacker Chris Orr (54) and Wisconsin Badgers defensive end Conor Sheehy (94) tackle Brigham Young Cougars running back Ula Tolutau (5) during the game at LaVell Edwards Stadium Saturday Saturday, September 16, 2017. Wisconsin Badgers are leading Brigham Young Cougars 24-6 at halftime. (Chris Detrick | The Salt Lake Tribune) Wisconsin Badgers wide receiver Danny Davis III (6) makes a catch over Brigham Young Cougars defensive back Micah Hannemann (7) during the game at LaVell Edwards Stadium Saturday Saturday, September 16, 2017. Wisconsin Badgers are leading Brigham Young Cougars 24-6 at halftime. (Chris Detrick | The Salt Lake Tribune) Wisconsin Badgers linebacker Leon Jacobs (32) Wisconsin Badgers defensive end Alec James (57) Wisconsin Badgers linebacker Chris Orr (54) and Wisconsin Badgers defensive end Conor Sheehy (94) tackle Brigham Young Cougars running back Ula Tolutau (5) during the game at LaVell Edwards Stadium Saturday Saturday, September 16, 2017. Wisconsin Badgers are leading Brigham Young Cougars 24-6 at halftime. (Chris Detrick | The Salt Lake Tribune) Brigham Young Cougars quarterback Beau Hoge (7) throws the ball for an interception on BYU's first drive of the game at LaVell Edwards Stadium Saturday Saturday, September 16, 2017. Wisconsin Badgers are leading Brigham Young Cougars 24-6 at halftime. (Chris Detrick | The Salt Lake Tribune) Brigham Young Cougars quarterback Beau Hoge (7) greets fans after the game at LaVell Edwards Stadium Saturday Saturday, September 16, 2017. Wisconsin Badgers defeated Brigham Young Cougars 40-6. (Chris Detrick | The Salt Lake Tribune) Brigham Young Cougars fans watch during the game at LaVell Edwards Stadium Saturday Saturday, September 16, 2017. Wisconsin Badgers defeated Brigham Young Cougars 40-6. (Chris Detrick | The Salt Lake Tribune) Wisconsin Badgers running back Garrett Groshek (37) leaps over Brigham Young Cougars defensive lineman Trajan Pili (52) during the game at LaVell Edwards Stadium Saturday Saturday, September 16, 2017. Wisconsin Badgers defeated Brigham Young Cougars 40-6. (Chris Detrick | The Salt Lake Tribune) Wisconsin Badgers running back Garrett Groshek (37) leaps over Brigham Young Cougars defensive lineman Trajan Pili (52) during the game at LaVell Edwards Stadium Saturday Saturday, September 16, 2017. Wisconsin Badgers defeated Brigham Young Cougars 40-6. (Chris Detrick | The Salt Lake Tribune) Brigham Young Cougars quarterback Beau Hoge (7) walks off of the field after being tackled for a safety by Wisconsin Badgers linebacker Tyler Johnson (59) during the game at LaVell Edwards Stadium Saturday Saturday, September 16, 2017. Wisconsin Badgers defeated Brigham Young Cougars 40-6. (Chris Detrick | The Salt Lake Tribune) Brigham Young Cougars walk off of the field after the game at LaVell Edwards Stadium Saturday Saturday, September 16, 2017. Wisconsin Badgers defeated Brigham Young Cougars 40-6. (Chris Detrick | The Salt Lake Tribune) Brigham Young Cougars fans watch during the game at LaVell Edwards Stadium Saturday Saturday, September 16, 2017. Wisconsin Badgers defeated Brigham Young Cougars 40-6. (Chris Detrick | The Salt Lake Tribune) Brigham Young Cougars head coach Kalani Sitake walks off of the field after the game at LaVell Edwards Stadium Saturday Saturday, September 16, 2017. Wisconsin Badgers defeated Brigham Young Cougars 40-6. (Chris Detrick | The Salt Lake Tribune) Brigham Young Cougars wide receiver Jonah Trinnaman (3) runs the ball during the game at LaVell Edwards Stadium Saturday Saturday, September 16, 2017. Wisconsin Badgers are leading Brigham Young Cougars 24-6 at halftime. (Chris Detrick | The Salt Lake Tribune) Brigham Young Cougars quarterback Beau Hoge (7) remains on the ground after being tackled for a safety by Wisconsin Badgers linebacker Tyler Johnson (59) during the game at LaVell Edwards Stadium Saturday Saturday, September 16, 2017. Wisconsin Badgers defeated Brigham Young Cougars 40-6. (Chris Detrick | The Salt Lake Tribune) Brigham Young Cougars quarterback Beau Hoge (7) remains on the ground after being tackled for a safety by Wisconsin Badgers linebacker Tyler Johnson (59) during the game at LaVell Edwards Stadium Saturday Saturday, September 16, 2017. Wisconsin Badgers defeated Brigham Young Cougars 40-6. (Chris Detrick | The Salt Lake Tribune) Brigham Young Cougars quarterback Beau Hoge (7) is chased down for a safety by Wisconsin Badgers linebacker Tyler Johnson (59) during the game at LaVell Edwards Stadium Saturday Saturday, September 16, 2017. Wisconsin Badgers defeated Brigham Young Cougars 40-6. (Chris Detrick | The Salt Lake Tribune) Brigham Young Cougars quarterback Beau Hoge (7) remains on the ground after being tackled for a safety by Wisconsin Badgers linebacker Tyler Johnson (59) during the game at LaVell Edwards Stadium Saturday Saturday, September 16, 2017. Wisconsin Badgers defeated Brigham Young Cougars 40-6. (Chris Detrick | The Salt Lake Tribune) Brigham Young Cougars quarterback Beau Hoge (7) remains on the ground after being tackled for a safety by Wisconsin Badgers linebacker Tyler Johnson (59) during the game at LaVell Edwards Stadium Saturday Saturday, September 16, 2017. Wisconsin Badgers defeated Brigham Young Cougars 40-6. (Chris Detrick | The Salt Lake Tribune) Brigham Young Cougars quarterback Beau Hoge (7) is chased down for a safety by Wisconsin Badgers linebacker Tyler Johnson (59) during the game at LaVell Edwards Stadium Saturday Saturday, September 16, 2017. Wisconsin Badgers defeated Brigham Young Cougars 40-6. (Chris Detrick | The Salt Lake Tribune) Brigham Young Cougars quarterback Beau Hoge (7) is chased down for a safety by Wisconsin Badgers linebacker Tyler Johnson (59) during the game at LaVell Edwards Stadium Saturday Saturday, September 16, 2017. Wisconsin Badgers defeated Brigham Young Cougars 40-6. Provo • A parachutist overshooting his mark crashed into the padded wall behind the north end zone at LaVell Edwards Stadium before the BYU football game on Saturday. He was pronounced OK afterwards, but the same couldn’t be said of BYU’s season. The 10th-ranked Wisconsin Badgers, looking very much the part of a college football playoff contender, steamrolled offensively inept BYU 40-6 in front of 61,143 fans on a picture-perfect fall afternoon that turned ugly for the Cougars (1-3). “He acknowledged that Wisconsin came in here and kicked our butts,” tight end Matt Bushman said of Sitake’s locker room talk. With redshirt sophomore Beau Hoge making his first career start in the place of the injured Tanner Mangum, the Cougars failed to score a touchdown at home for the first time since 2005, when they fell 20-3 to Boston College. Hoge completed 11 of 20 passes for 111 yards, was intercepted on his first pass of the game, another time in the fourth quarter, and then finished his performance by failing to throw the ball away in the end zone and then fumbling for a Wisconsin safety. Wisconsin’s defense had Hoge running for his life, and shut down BYU’s rushing attack after the Cougars teased their fans early with a 14-play drive that gained 79 rushing yards before a holding penalty on Tuni Kanuch eventually brought on Rhett Almond for a 32-yard field goal. The Cougars finished with 81 yards on the ground, and ran 46 plays, including five in the fourth quarter. Wisconsin dominated time of possession, holding the ball for 40 minutes and 9 seconds and racking up 491 yards and 28 first downs. The Badgers were 8 of 12 of third down, with sophomore quarterback Alex Hornibrook picking apart the Cougar defense when he had to. Hornibrook set the Wisconsin single-game completion percentage record, going 18-for-19 for 256 yards and four touchdown tosses. It took Butch Pau’u wrestling the ball away from a wide receiver for Hornibrook to not have a perfect day. “He’s very accurate, and he’s very calm under pressure,” Pau’u said. Corbin Kaufusi did catch Hornibrook for a sack, BYU’s first sack since the 20-6 win over Portland State in the opener, but the Badgers’ QB was barely touched the other 20 times he dropped back to pass. “He was 18 for 19, golly,” Sitake marveled. 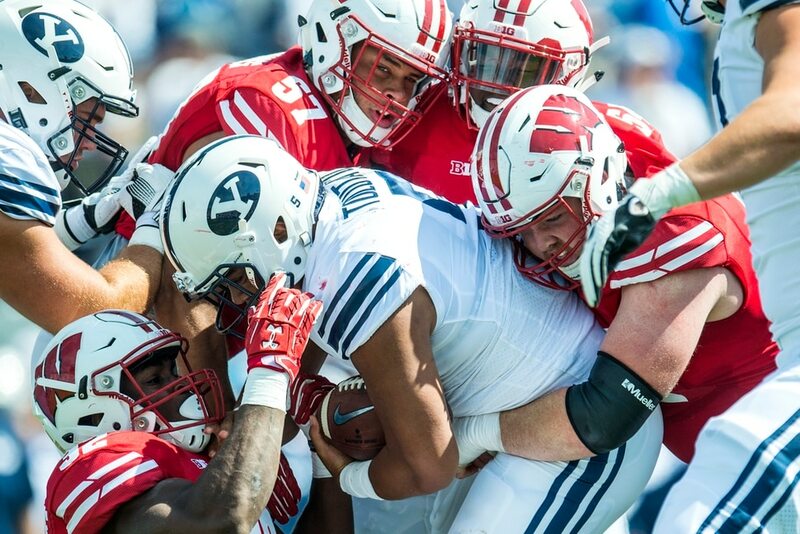 Hornibrook was 8-for-8 on his third-down throws, and Sitake said BYU’s lack of a pass rush can be attributed to the Badgers being able to run the ball at will. It was BYU’s worst home loss since a 54-10 demolition at the hands of Utah in 2011. It is also the first time BYU has lost two games by 27 or more points in the same season since 2004 — the last time the Cougars failed to make it to a bowl game. Wisconsin coach Paul Chryst rested Jonathan Taylor in the fourth quarter after the freshman picked up 128 yards on 18 carries, but was still trying to score in the final minutes with a 34-point lead. Sitake said he was “glad” that the Badgers kept at it, rather than take a knee. Wisconsin hosts BYU next September in Madison. “I think we played better defense against LSU,” Sitake said. “Looking at the numbers we had eight more plays [than vs. LSU]. It is difficult to win games when you are only getting 200 yards of production and not getting in the end zone. When your defense isn’t playing great, there is your result: 40-6. •Badgers quarterback Alex Hornibrook plays flawlessly in completing 18 of 19 passes for 256 yards and four touchdowns. • In his first college start, BYU QB Beau Hoge completes 11 of 20 passes for 111 yards, is intercepted twice and fumbles in the end zone for a Wisconsin safety. • The Cougars generate 192 yards of offense and give up 491 to the Badgers.